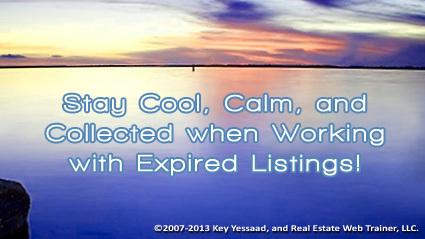 Many Real Estate Agents, during this time of the year, start focusing on Expired Listings and it is important that you remember these basic ideas: Home Sellers who have just experienced an expiration of their listing are undergoing lots of mixed emotions; 1. Relief that they are no longer working with Agent A at Brokerage B; in their mind the sale did not occur because they were let down by that agency and that agent – other true facts do not matter to them. 2. Anger that others were able to sell but that they could not get their home sold, which in their mind the listing agent never did enough to bring them the ‘right’ buyers. 3. Resentment towards the whole brand the agent works for, as well as the whole industry. Of course they are going through all kinds of emotions of failure and rejection; your job, if you are going to get the listing from them, is to find some time at the appointment to let them vent without appearing to side with any of the circumstances; in fact the more they vent and share their anger and resentment the calmer you should remain. The worst mistake you can ever make is to take on their complaints about Agent A at Brokerage B and amplify them; discuss your strategy and your plan to sell their property without putting down anybody out there – return them to their commitment of selling their home, and find out why they wanted to move/sell in the first place.